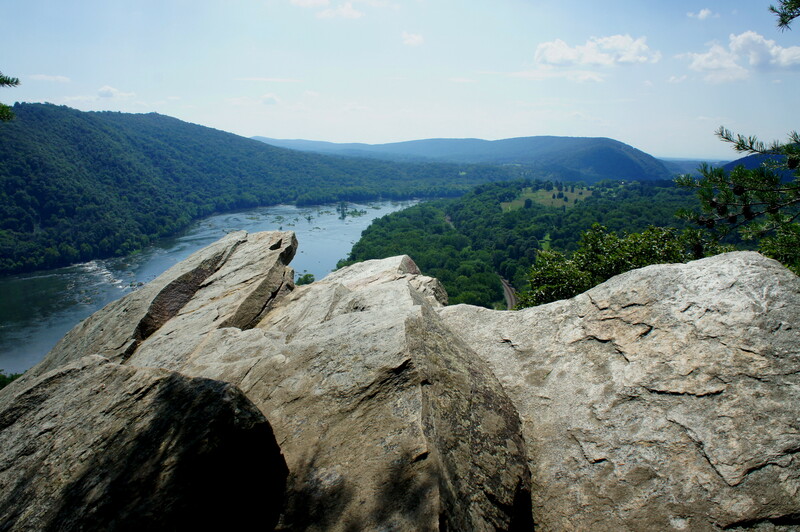 Perched at the southern tip of South Mountain, more than 500 feet above the Potomac River, Weverton Cliffs in central Maryland is easily one of the state’s most scintillating viewpoints. 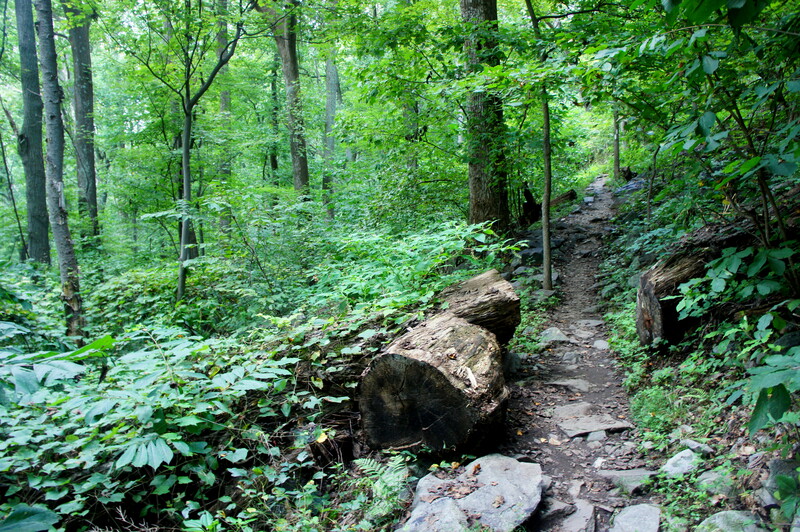 It is also relatively easily accessible—less than a mile’s hike up the famed Appalachian Trail from the small community of Weverton, which in turn is a short drive from Harper’s Ferry, West Virginia. 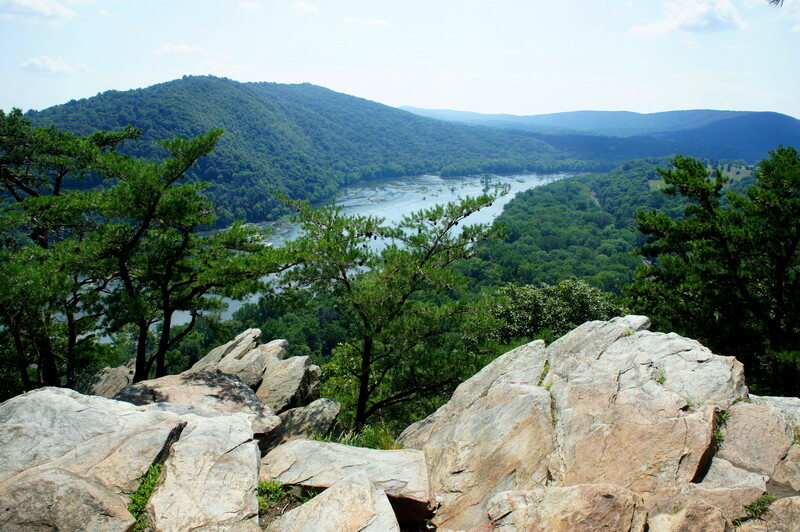 Visitors to Harper’s Ferry should consider this hike as a less crowded—and arguably more scenic—alternative to Maryland Heights or Loudoun Heights upriver. The trail begins at a white-blazed telephone pole adjacent to the parking lot; look for a narrowing clearing heading southeast into the woods. Within seconds, this small spur meets the AT; bear left (northbound) at the fork. Snaking through the woods below the roadway on the left, the AT crosses Weverton Road at 0.07 miles. Rocky stairs at the other end of the road mark the beginning of the upward climb. Stop at the trail kiosk on the left for a map of Maryland’s 40 AT miles, then continue up the woody hillside. 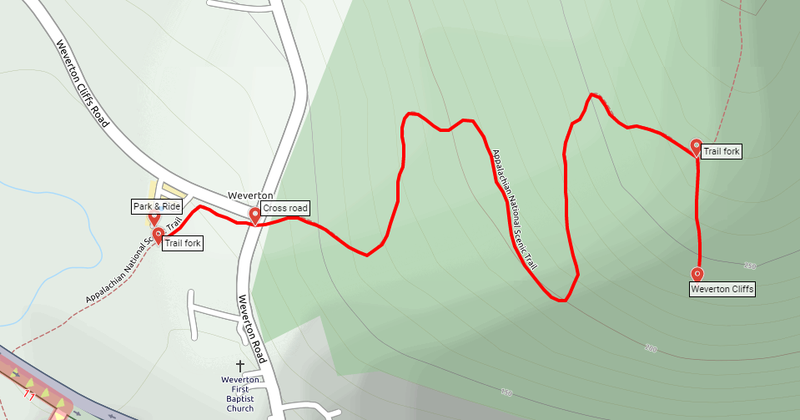 The incline picks up at around 2/10 mile, but gently sloping bends lessen the burden. During a southbound straightaway, the trail levels out as it approaches a group of three short switchbacks at around ½ mile. Following a short climb, the AT tracks northbound to a pair of switchbacks at 6/10 mile, then climbs three more to reach the base of a rock wall on the left. Four more switches get hikers to the top of the wall, but the trail leaves the rocks behind as hikers make a final push to the hike’s high point at around ¾ mile. Here the route forks. 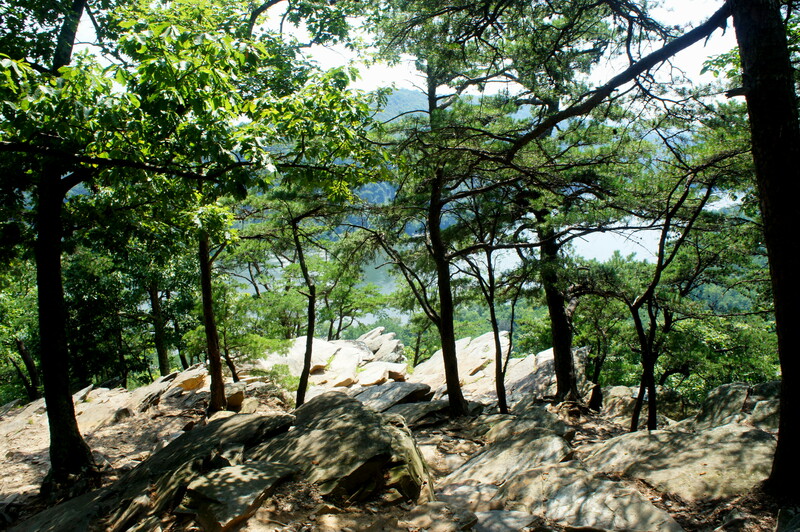 While the AT continues left, take a right on the spur to Weverton Cliffs to reach your destination. The trail effectively dissolves away shortly after the junction, but it is simple enough to descend the slope—dropping around 60 feet in elevation to the jagged edge of the cliffs. The views from Weverton Cliffs are truly fantastic. Ahead of you the mountain drops 500 feet to the Potomac River, while Buzzard Rock (1,183’) and Short Hill Mountain (1,424’) continue along the other side in neighboring Virginia. 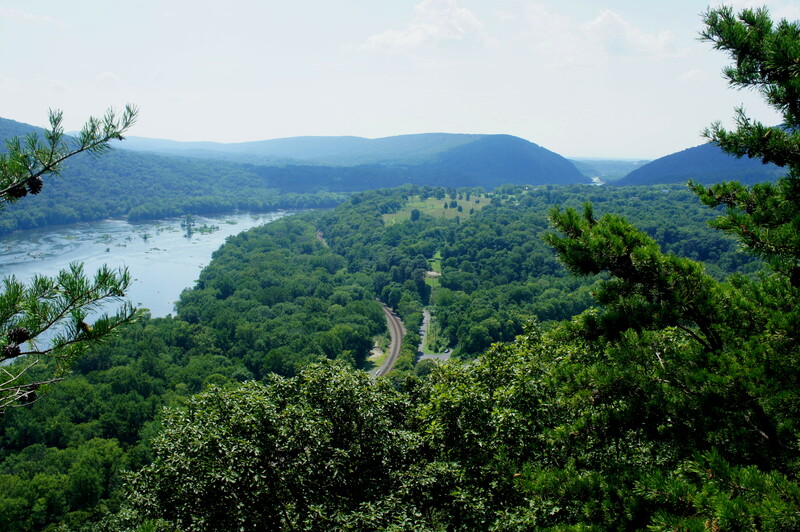 On a clear day, it is also easy to spot the gap in the heights to the west where Harper’s Ferry is situated. Abundant shade near the cliff’s edge offers a nice opportunity to have a seat and a snack and take in the scenery. Return the way you came, enjoying the much-easier descent to the Park & Ride. Allot around 1.5-2 hours for the hike. 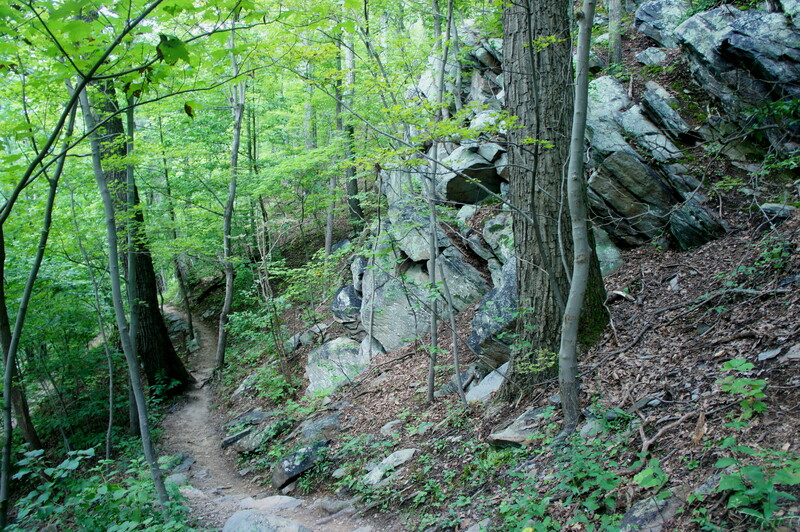 This entry was posted in Maryland, Moderate Hikes, South Mountain State Park and tagged Appalachian Trail, Harper's Ferry, Maryland, Potomac River, South Mountain, South Mountain State Park, Weverton Cliffs. Bookmark the permalink. We just returned from a trip to West Virginia and Maryland and took our kids, ages 5 and 7, on this hike after reading about it here. They loved it and it was the perfect distance for them. Thanks for sharing it! Is the park and ride big enough to park a small RV? Hi Karen – I’m not sure. On a crowded day in summer, it might be tough. But maybe during the rest of the year.